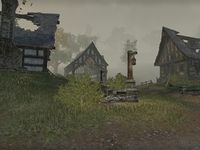 Pell's Gate is a settlement located east of the White Rose River in the Heartlands of Cyrodiil. It can be found where the Red Ring Road joins with the Green Road, in the region known as the North Weald. Before the Alliance War of 2E 582, Pell's Gate was seemingly a well-established town. 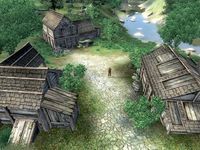 However, Legion patrols became less frequent when war broke out, and bandits began to threaten the town and raid its livestock. It was eventually overrun by the Homestead bandit clan from the nearby ruins of Fort Homestead, who then destroyed and occupied the settlement. Several of the townsfolk managed to escape, and fled to the town of Vlastarus. By the late Third Era, Pell's Gate was only a collection of shacks. At some point, a Bosmer girl from the village named Lenwin came into possession of the Umbra Sword. The sword caused her to grow bloodthirsty, and she began calling herself Umbra after the sword. Eventually she departed Pell's Gate to join a group of mercenaries, before ultimately returning to the area and taking up residence in the nearby Ayleid ruins of Vindasel. In 3E 433, Clavicus Vile tasked the Champion of Cyrodiil with tracking down the sword, which resulted in Lenwin's death. During the Oblivion Crisis later that year, farmers from Pell's Gate were recruited by the Imperial Legion to close a nearby Oblivion Gate. After the Gate was destroyed, the fortifications that surrounded it grew into the town of Ione. By 4E 40, the towns of Sweetwater and Easterbridge had also sprung up in close proximity to Pell's Gate. This page was last modified on 21 October 2018, at 08:19.